I promise I didn’t time this week up to coincide with the completion of the first floor shower. There’s no way we could meet a deadline like that. Also, you’ll have to bear with me – I’m writing this through a fog of cold medicine, and I never get “regular” sick. I only get things like migraines and vocal cords that need surgery and things like that. I have the teacher immunity of steel, probably from being around so many instruments ALL THE TIME. So having a cold throws me for a loop. If this makes no sense because I keep drifting off into daydream land, maybe it’ll at least be amusing. Or completely boring. Either way, I’m sorry. 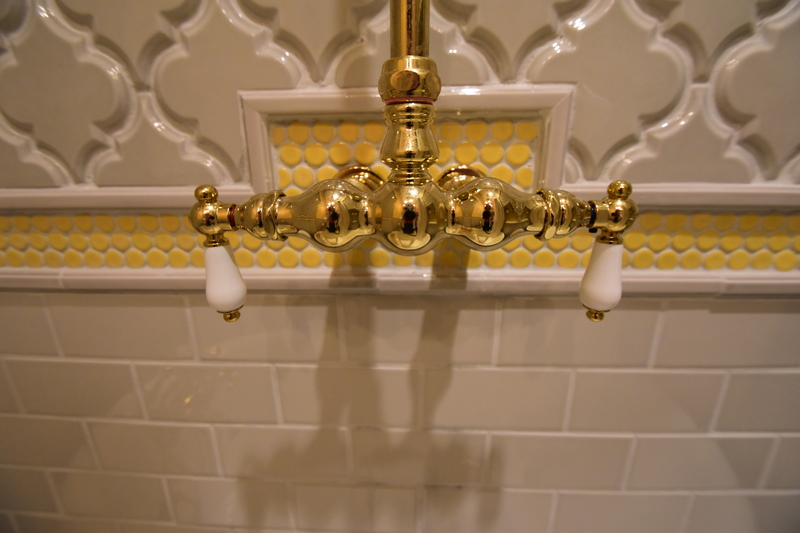 I love plumbing fixtures – and pipes, even. They’re so super sculptural, and really can be art pieces in a bathroom or kitchen. 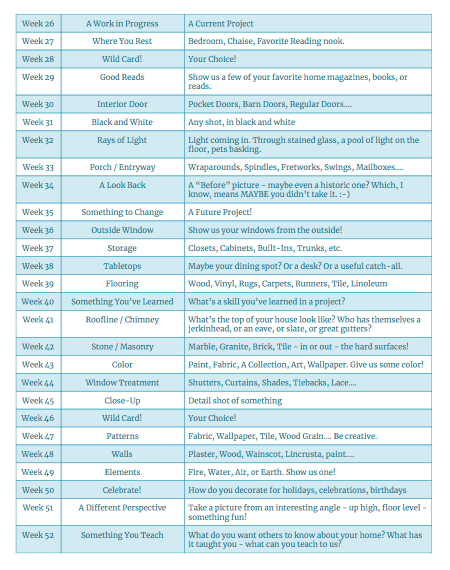 They can also be just super plain and functional, and there’s complete beauty in that, as well. “Show Us Your Pipes” sounds Risque. Or maybe it’s just a call-back to vocal cord surgery. 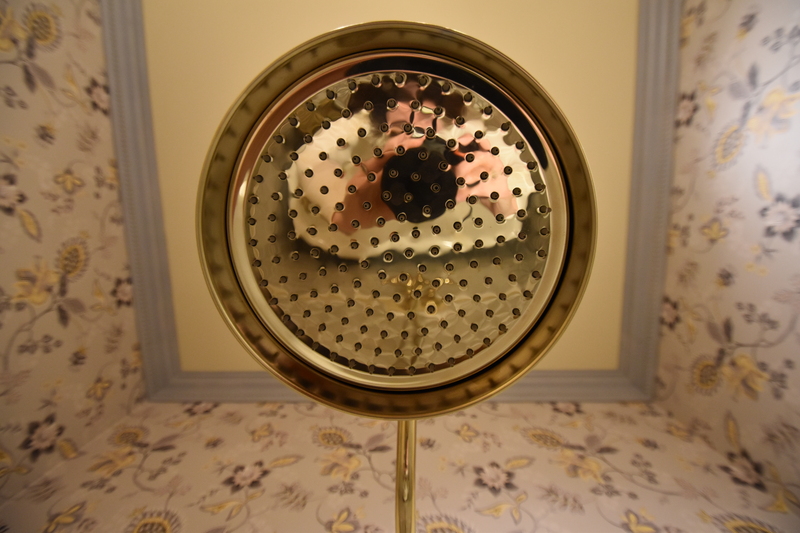 I feel like I’m pretty well ensconced as a “traditional” bath fixtures person. 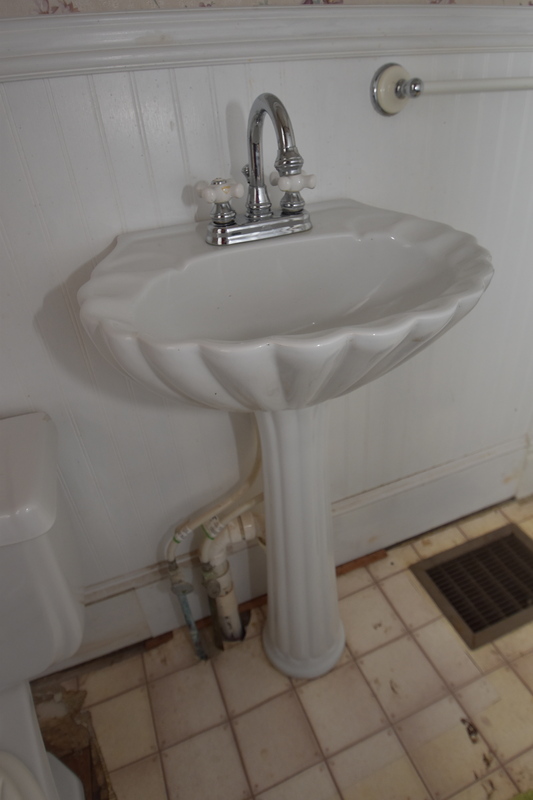 I definitely am drawn to things that are curvy and Victorian in nature, and I can’t really see putting modern fixtures in our house (but I LOVE them in others). 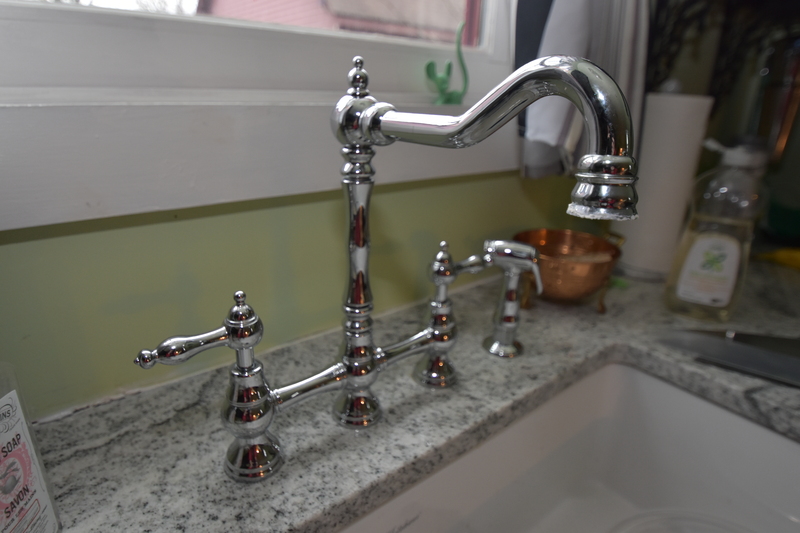 The faucet that we put in the kitchen is pretty much my favorite style. And I love chrome a lot. 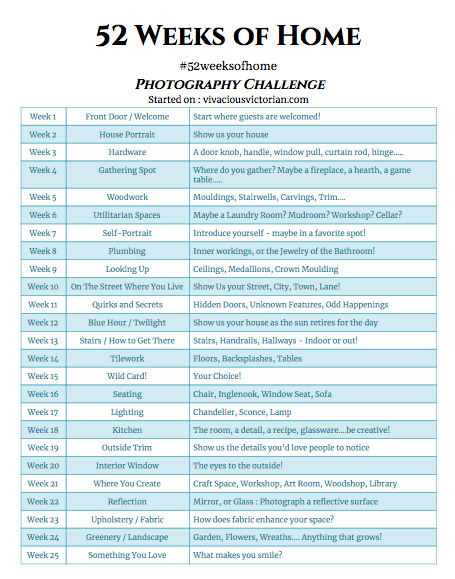 In the laundry room, we were really trying to spend as little money as we could (while still trying to match the house). The sink was actually the sink from the kitchen when we moved in, so we re-used it because it was the perfect size and pretty. 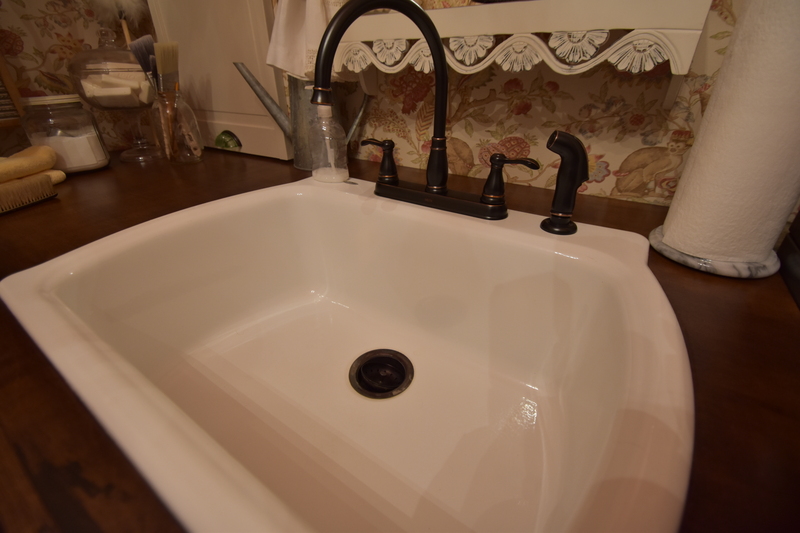 And then I looked for the cheapest, most Victorian-looking (which is harder to find than you’d think in a box store) faucet, and this oil-rubbed bronze set was on clearance. Perfect. The goose neck is nice, too, because I fill a lot of buckets in here. 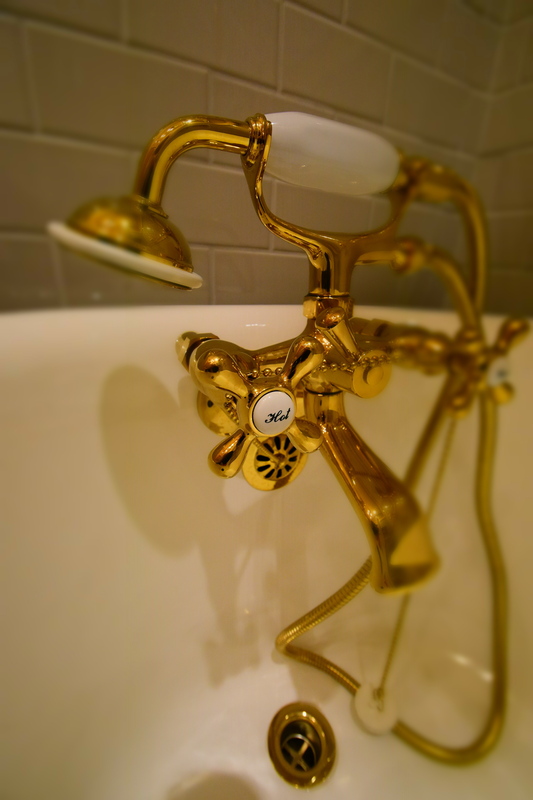 And I know you’ve seen them recently, but I adore the new fixtures in the first floor bath. But the BEST example of “Previous Owner Plumbing” comes to us via the bathroom off the balcony bedroom. 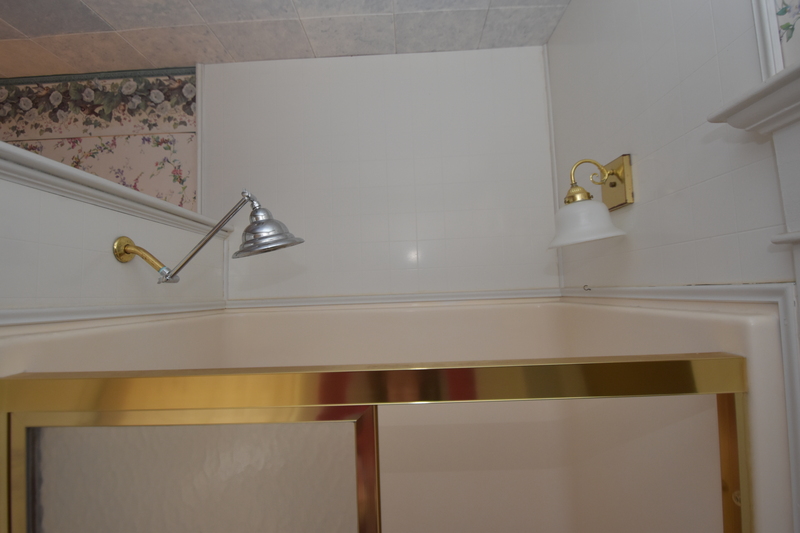 Because the SHOWER HEAD MATCHES THE IN-SHOWER SCONCE. It’s like they’re in a constant stand-off with one another, waiting for the other to blink. And before you freak, the sconce isn’t electrified anymore. And no, I can’t answer any of your questions on the matter. I have no idea. None. The hall bathroom (which isn’t totally functional) has this sink that I have an Adore-Abhor relationship with. I love the faucet. I love the idea. It’s a great color. Pretty sure it’s from the 90s. I hate the pipes and supply lines – but those could be changed. But it’s SO tiny. And has a slope on it that makes it hard to even put soap on the edge. So I’m not convinced it’ll make it into the future bath up there. But I’m not sure. Do we like the seashell? Discuss. I feel like if I don’t TOTALLY love it I shouldn’t keep it. But for now, it works, and even though we don’t use this bathroom at all yet, it might have a future. We’ll see. Previous PostAnd the Shower is IN! 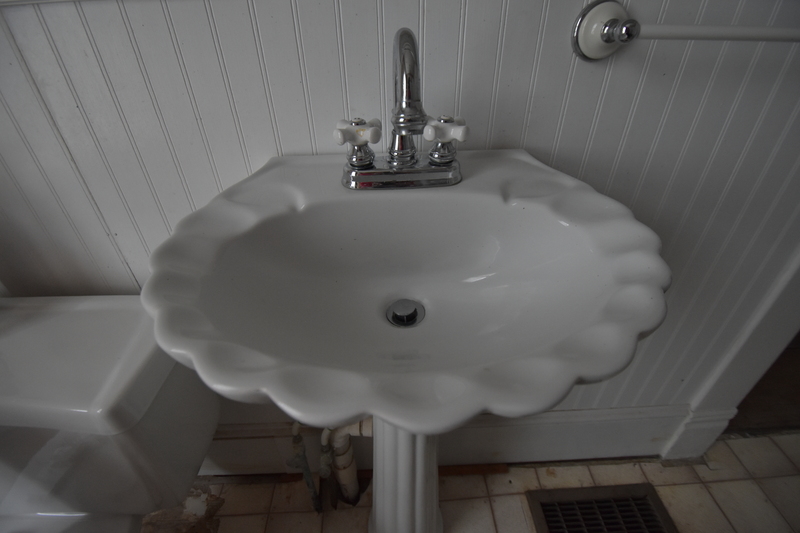 I really like the scalloped edges on the sink. I’ve never seen one with so many of them. I’m thinking you could really play that up with a sea shore theme, shells, other scallops on wall paper, etc. Knowing your talent for such things I think you could really make it shine.